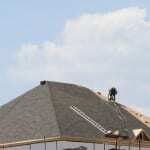 Get quality roofing replacement for a great price on your home in Midland. Deciding to replace the roof on your Midland, Ontario, home can be a difficult choice to make. You don’t want to replace a roof that does not need it, since roofing replacement can be a big investment. However, if you do not replace a roof that needs it, you can have a lot of problems, like a leaking roof or mold damage, and it can even put your home at risk for flooding. At Slippery Slope Roofing, we know how important it is to you to find a company for roofing replacement that not only does quality work, but is honest and reliable, as well. We have years of experience doing roofing replacement. We pride ourselves on doing quality work for our customers, and we make sure the work is done in a reasonable amount of time. We also offer very competitive prices. We won’t overcharge or scam you; we only do work that needs to be done. If you are not sure if your roof needs to be replaced, you can have us come and take a look at it. A good indicator that you could benefit from roofing replacement is if you are missing shingles, your roof is leaking, it is over 20 years old, or you find any soft spots on the roof. If you have any of these things going on, you should have your roof looked at. Your roof is designed to protect your home from the elements, and if the roof is in poor condition, it will not function properly. If you need roof replacement services, contact us today at Slippery Slope Roofing. We guarantee we will do great work, and we have great warranty options. We do all roofing based on manufacturer requirements to make sure you get a quality new roof for an affordable price.